1/ As tall as possible, to stop highway noise escaping over the top of the barrier. 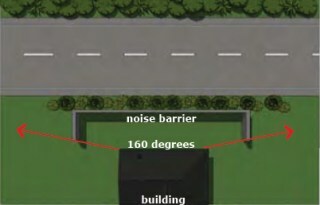 2/ As dense as possible, to stop road noise passing through the barrier. 3/ Have no gaps or holes in or under the barrier, that allow road noise to pass through. 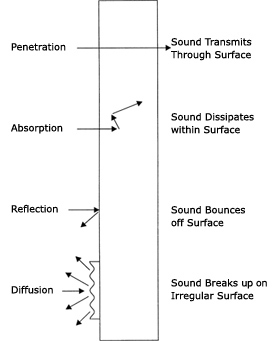 4/ Have an irregular surface to diffuse the sound when it hits the acoustic barrier. 5/ Wide enough, so that traffic noise does not get around the sides of the barrier walls. 6/ Constructed to create the most effective acoustic sound shadow possible. Smooth surfaced, reflective concrete noise barriers, will bounce most of the noise back into the environment. The preferred noise wall option, is one controls the sound, absorbs, diffuses and reduces the noise. The majority of highway noise travels by line of sight, if you can see the trucks you will be able to hear them, a low wall will not stop the noise from the bigger and heavier trucks on our roads today. 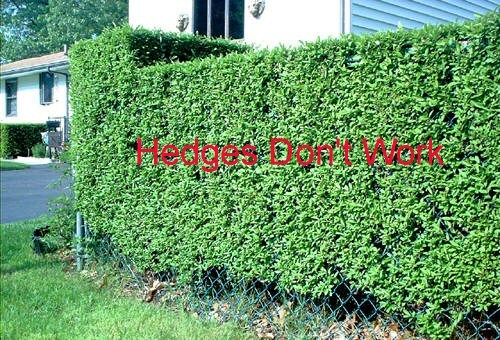 This hedge lets noise over, under and through it. Dense plantings must be over 20m wide before they provide any significant noise reduction. 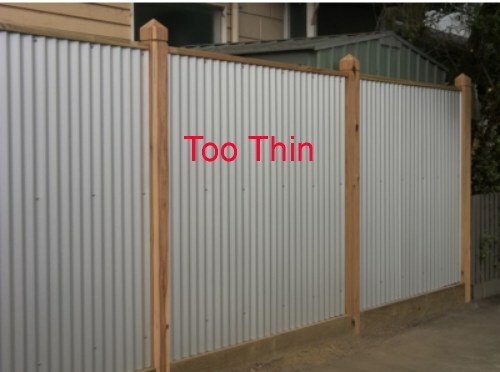 The corrugated iron fence, is so thin that more than 80% of road noise from a large truck will pass straight through the fence. Not a good noise reduction fence. This gabion wall's surface diffuses and reduces the traffic noise, the noise is unable to go under or through the wall. This creates an acoustic sound shadow behind the wall. 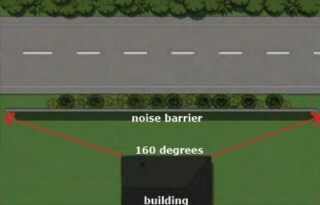 When constructing an acoustic wall to eliminate highway noise. The height, width and location of the noise barrier wall, dictates the size and shape of your noise shadow. Noise from heavy trucks is around 85db. The denser the wall the more noise it stops, a 100% solid timber fence will only stop 25db of noise, the remaining sounds passes through. 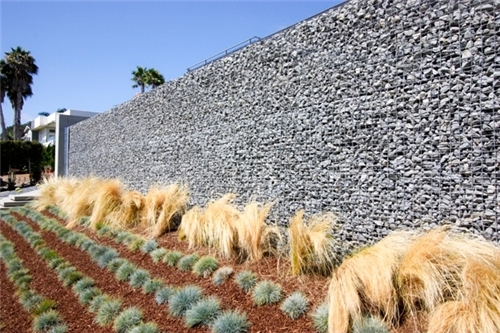 The gabion noise barrier wall stops the most direct road noise.